Another sunny autumn day suggests another walk through the park. I cannot go without my camera, even though we did this a week ago, there may be something different in McArthur Park. It is amazing what a difference one week can make during this season of changing colors. We have visited this park several times during other autumn seasons but I have never seen the colors quite like this. The McArthur Park Slough with Mt. Paul and Peter in the background is a beautiful sight today. We met some park greeters! These ducks headed straight towards us as we crossed the footbridge over the slough, fully expecting us to have some treats for them. We did not so they soon went on their way. The little tree hugger was pretty curious but soon knew we had nothing for him, either. We followed the footpath that loops around the McArthur Island Golf Course and enjoyed the colors of the leaves of the trees on the golf course. There were several different colors which aren’t part of the indigenous tree colors. Lush green grass, beautiful colors and no golfers. What we do see are several deer, including a deer family enjoying that lush green grass! This is exactly why I could never leave my camera behind. One just never knows what they may see. Two deer were playing up under the big tree. It is difficult to see the antlers through the tree branches but we were able to see them on one of the deer when they separated. This wrestle only lasted a moment, time for three quick photos and they were back to grazing. This buck was oblivious to the playing going on and stayed closer to the doe and the young one. We moved to another opening through the fence and using my other lens, I was able to take photos that looked like we were right up close, but we were far enough away, they didn’t even notice. We saw six deer altogether on the course, two of them are just over the crest of the hill taking a rest and their heads are barely seen from here. There may have been others, this seems to be a permanent home to them as we’ve seen some on golfing visits, too. More trees, more autumn colors to enjoy but no deer in sight as we near the end of the path that encircles the golf course. We do see some golfers that will soon be surprised to see what is ahead of them. The golf course is a great example of a local park for all to enjoy, even if you are not a golfer, but more so if you are. The quiet walk in the park includes a pretty view of the Thompson River and the city of Kamloops in the distance. 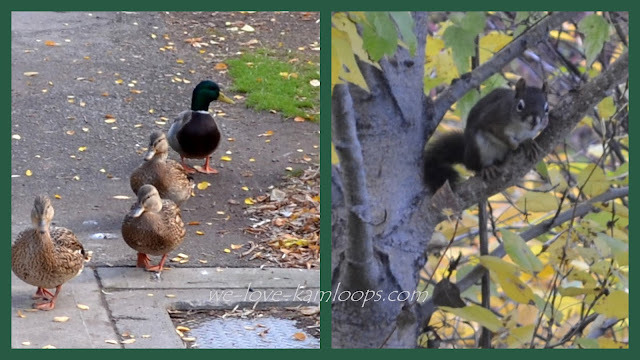 Other than the deer, ducks and squirrels we saw here today, there are other residents to enjoy. Canada Geese find the park a perfect winter home and are often seen and heard flying overhead. These large geese appear to avoid the golf course but spend most of their time in other parts of the park and add quite a lot of high quality phosphate to the grounds! We are enjoying a few lovely sunny days following some big October rain. The cool crisp weather makes for a beautiful blue sky with fall leaves starting to make their changes. Our first stop today is at McArthur Island Park on the north shore where the Slough offers some nice reflections of color. The Thompson River level is low at this time of year and offers some quiet waters for the ducks and geese to enjoy. While taking photos of the geese on the river, I happened to look down and what a surprise! A beautiful doe was munching on the leaves and then hidden behind the bush there was a baby with her. We watched quietly for a while then walked away for a bit so not to disturb them anymore. When we came back, the doe was still out but we saw two babies nestled under the bushes nearby, almost impossible to see. Click here and here to see more of the park on other visits. We then moved on to visit Riverside Park in downtown Kamloops. It is still early for all leaves to be turning but with the ones that are, offer a pretty contrast against the blue sky. Not being bike riders, it may have been here awhile but we hadn’t noticed this bike repair station before. It is about the size of a golf bag but has air and fix-it helpers for bike repairs. What a great idea for those bikes that may need help while on the Rivers Trail. We have had some great rain this year which gives us lots of green to enjoy at our parks. Riverside Park was developed in 1902 and has evolved into a beautiful park in Kamloops. Click here to see more of the park on another visit. There have been some recent additions made at Riverside Park which includes new pickle ball courts by the tennis courts, which are also still there. Pickle ball has become a very popular sport in Kamloops. Standing strong by one of the entrances to the park is this great ¾ life size bronze bull, Oblix. He was first put in the park in 2007 representing the ranching heritage of the area. Donated to Kamloops by the artist Joe Fafard who sculpted him, he was recently moved to this new location in the Park. There is a plaque in this tiny park on Schubert Drive along the North Thompson River that commemorates the Schubert Family who were a part of the Overlanders who came to the area in 1862. Shortly after their arrival, baby Rose was born on Oct. 14, one hundred and fifty four years ago this week. There are several parks in the city, many of them with beautiful fall colors at this time of year. Hopefully we can all enjoy more sunny days to watch the changes of the season.